We have a few art books and some of them are shown on this page. I have, but seldom used, Drawing With Children. The instructor must read the front of the book thoroughly to get an idea about how to teach from the book. I have written some about Drawing with Children and on the Drawing with Children page, I've highlighted the contents in red that must be understood before starting. Another book that some homeschoolers like is Drawing on the Right Side of the Brain. I do not have that book but I have checked it out from the library a few times. My daughter used AOP Lifepac Electives Art, and I used John Ruskin's, The Elements of Drawing and Rockman's The Art of Teaching Art as a guide for our high school art classes. Before high school we used my drawing printable files, and more often than not, I allowed the children to draw whatever they wanted to draw. Several times a year I guided them with "lessons" about art principles and techniques. I also added drawing assignments to other classes: labeled specimen and various nature drawings in science classes and various related drawings in social studies classes. For perspective, I used several books. I used least the book Lessons in Perspective Drawing published by Rod and Staff. Unit Four from AOP Lifepac Electives Art has actual perspective drawing lessons and could be considered as beginning. For advanced perspective, I used Rockman's The Art of Teaching Art. Some versions of John Ruskin's, The Elements of Drawing: in three letters to beginners also covers perspective. We didn't do a lot of music, however, we listened to classical music almost every day and for a few years we had some sort of lesson once a week. I have an Usborne music history book and the music theory book, Keyboard Capers. My children have instruments that they can play. John used to take violin and mandolin lessons. Holly plays the ocarina sometimes. The children learned some popular tunes on the keyboard when they were younger. For a few years, I bought tickets to performances that were hosted by a nearby university. Performers came from all over the world. All of the performances were professional and inspiring and that was worth more than I spent on the tickets. Pictured here with some other art books are some of my art history books. 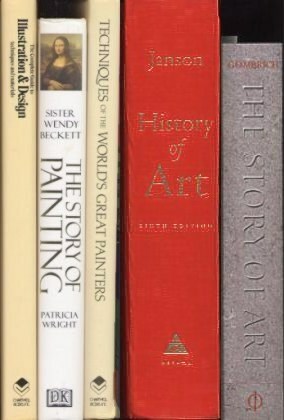 Janson's History of Art (the red one pictured above) is quite a book. I assigned more pages out of it than any of my other art history books. It's very expensive though. Years ago, I scanned the spines of some of our books, we have added books since then and those are not pictured. As you can see by the pictures, we have several manga books. That is a reflection of my daughter's interest in drawing comics, specifically in manga style. Take it from me, if your child wants a manga drawing book, look at every singe page before buying one. I recently asked my daughter which comic books are better and she replied that each one is good for something and then she went into some details such as, this one is a good reference for --. You might wonder why I included The Timetables of History among the art books. Grun's book is about the life of humans and he included the arts and so, this is also an art book. The Timetables of History was the MOST valuable book to me when connecting history to art. Pictured on the right are my Ruskin and Rockman books and as far as I am concerned these books rule in the area of teaching drawing, how to do it, and what to teach. Here at my web site, I will make many references to these two books when I write about teaching art to older children. The note: The book has nudes. The Art of Teaching Art is written for college professors who teach drawing at college level. I used the book for ideas prior to high school and during high school I used the book for some of my daughter's art classes. Ruskin's book is for ages 13-14 and up. He does not recommend his method for (in his words) "In the first place, the book is not calculated for the use of children under the age of twelve or fourteen." 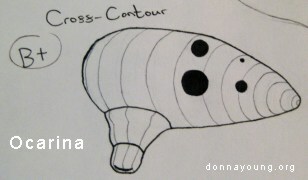 However, YOU the instructor can use the book and in turn, become a better art teacher.